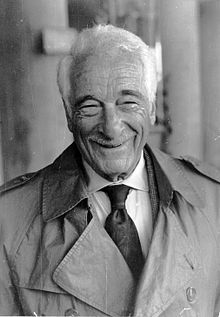 Victor Borge (January 3, 1909 – December 23, 2000), born Børge Rosenbaum, was a Danish comedian, conductor and pianist, affectionately known as The Clown Prince of Denmark, The Unmelancholy Dane, and The Great Dane. What is the difference between a Nazi and a dog? The Nazi lifts his arm. I only know two pieces, one is 'Clair de Lune', the other one isn't. When I was a little boy and played Liebestraum, my father used to hit me on the head with a newspaper every time I slopped the cadenza . . . I hate Liebestraum. I learned to play the piano on my mother's knee - that was before we got a piano. [of English] It's your language. I'm just trying to use it. The first piano was built long after they didn't have any at all. ↑ Victor Borge, "Smilet er den korteste afstand (The Smile is the Shortest Distance)"
This page was last edited on 15 January 2016, at 22:47.